Who knows my real name or knows me in real, surely also knows that I'm a big fan of neckties. Well, I must clarify immediately that I'm not a fan of any kind of tie: I dislike all those common and (pretended to be) fancy ties that u can usually see around and I have instead a real passion for the so called "novelty" ties, being most likely the biggest collector of them in my country (Italy). What do I find so nice in them? Well, "novelty ties" (usually in polyester) have a specific content printed on: not just a solid colour, not a fantasy or geometric or abstract or paisley pattern, not just stripes in regimental style... they have a special design with something well defined (an object/animal/cartoon/character/famous painting/etc), that becomes important to make the necktie more attractive. Cool. I especially like that Asteroids tie, wonder how many kids nowadays would instantly recognize that it's a game tie. 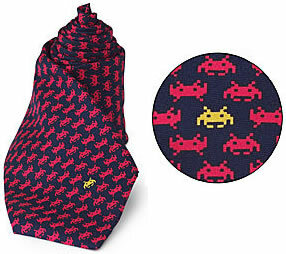 Also Space Invaders tie has some weird attraction... I don't know if it's silly or very very cool. I'd wear all of them, not at once, at work with my suit!! Not that I wear a suit at work these days, but if I did I'd absolutely wear any one of those ties!!! The TJT wrote: Cool. 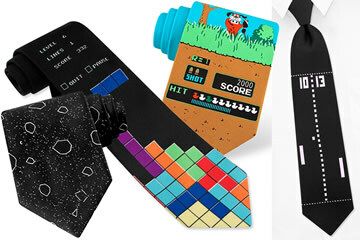 I especially like that Asteroids tie, wonder how many kids nowadays would instantly recognize that it's a game tie. BeeJay wrote: I'd wear all of them, not at once, at work with my suit!! Not that I wear a suit at work these days, but if I did I'd absolutely wear any one of those ties!!! how about this for a tie?